N.B.! 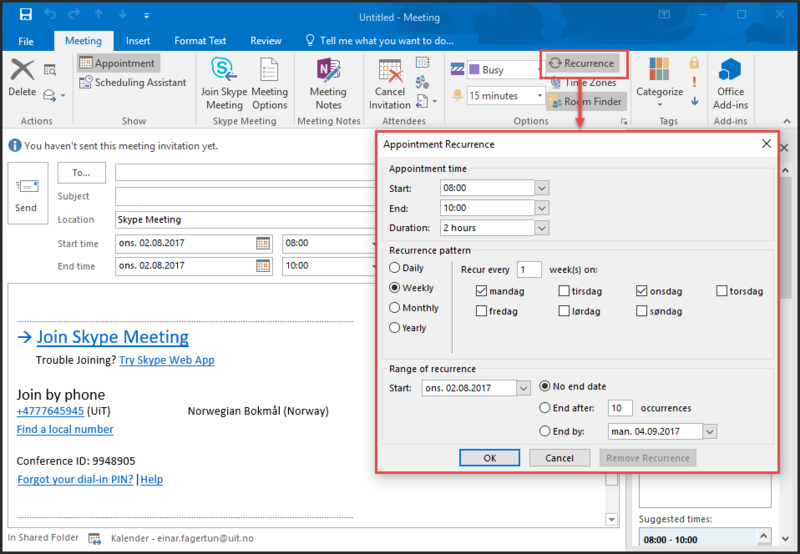 Outlook will reject the recurring meetings if more than 50% of the room bookings collide with existing meetings. When you book recurring meetings, READ THE ENTIRETY OF THE AUTOMATICALLY GENERATED EMAIL SENT BY THE ROOM! You may wish to open the calendar for the room(s) you are trying to book to get a better overview of openings. Click the "Recurrence" button. This allows you to set how often the meetings will occur, whethe they occur on a certain weekday or date each month, and how long the recurring meetings will last. Please note that you need to choose either a set number of meetings or an end date for the recurring meetings for the recurrence to take effect. Choose a room and press send. This way you can avoid your attendees receiving multiple emails with corrections after they receive a meeting invitation. Next you will receive an email receipt from the meeting room. Note that even though the subject line says that your recurring meetings have ben accepted , there may still be conflicts and double bookings in the series . As you cannot schedule a meeting in a room that has already been booked, you will receive a separate email receipt for the time slots that were rejected . You will need to manually correct these conflicts by changing the start- and end times or changing the meeting room for these dates. N.B.! The room reservation will still show up in your calendar even if there is a scheduling conflict rejecting the meeting. This is why we recommend that you open the calendar of the relevant room to let you see any potential conflicts as well as alternate time slots. The easiest way to do this is to open the calendar of the room in question and navigate to the time and date of the conflict. Drag the meeting (in your own calendar) to a free time slot . You will receive a notification informing you that the meeting has been moved. Select "Save changes and sendt update"  and click "OK". An email window will open for you to send. This email will update both the room calendar and your personal calendar. After all conflicts have been resolved, add attendees. Double-click the first meeting, and you will be asked whether you wish to update this separate occurrence, or the entire series. Select "Open the series". 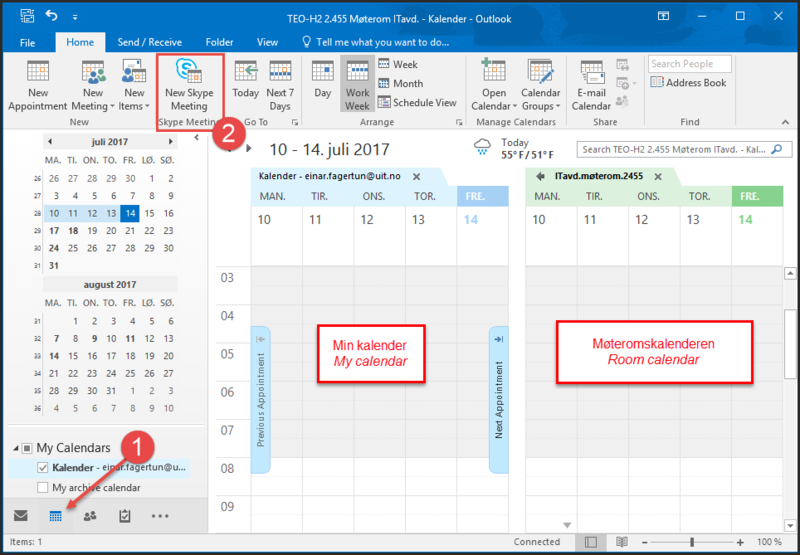 At this point, you may add attendees for the entire series of meetings as described under point 1.2 in our guide for Outlook 2016 - Schedule a meeting. Once you have added attendees, click "send" and the meeting invitation will be sent via emal to all participants.